The capacity of thirty-three plant breeders from the National Agricultural Research Systems (NARS) of eight African countries has been upgraded to competently take on the demands of advanced plant breeding using the latest technologies. Bruce Walsh from the University of Arizona: I have a real passion for teaching students in Africa. Through a training coordinated by Ismail Rabbi, IITA’s Molecular Geneticist/ Breeder and organized by IITA’s Capacity Development Office (CDO) in Ibadan from 5 to 9 September, the breeders from the Gambia, Kenya, Mali, Nigeria, Senegal, Sierra Leone, Tanzania, and Uganda learnt about Advanced Plant Breeding and Quantitative Genetics from Bruce Walsh, a renowned authority from the University of Arizona. The curriculum covered recent tools in Genetics and Statistics as well as Quantitative Trait Locus and Association Mapping. Walsh described the training as “challenging but essential”. He added “I have a real passion for teaching students and I really enjoy teaching in Africa. The students actively participate and are keen about learning”. “This course is vital for breeders…IITA hopes to regularize this training annually as a contribution towards creating opportunities for the skills of several African plant breeders to be improved. This, we believe, will assist us in our mission to tackle the challenges facing African agriculture and food security,” Rabbi said. Zoumana Bamba, Head CDO also said that the researchers need to be up to date in the challenging world of plant breeding, hence the training. 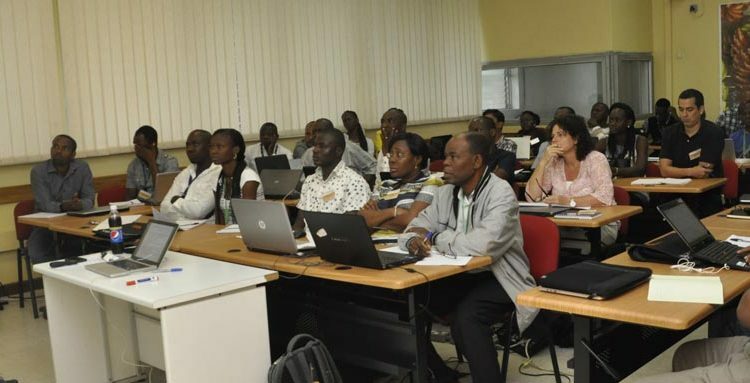 “The constantly changing environment and new knowledge and technologies in plant breeding require that IITA invests in continuing professional development for scientists. We (IITA) are investing to keep scientists abreast of new knowledge, techniques, and developments and for them to be keenly aware of the changing landscape of agricultural research to improve IITA’s research-for-development agenda”. Stanley Nwachukwu, IITA Training Manager also counseled the researchers. “This is a great training from IITA, do not abuse the opportunity, use the acquired skills efficiently and come out better after this training” he said.